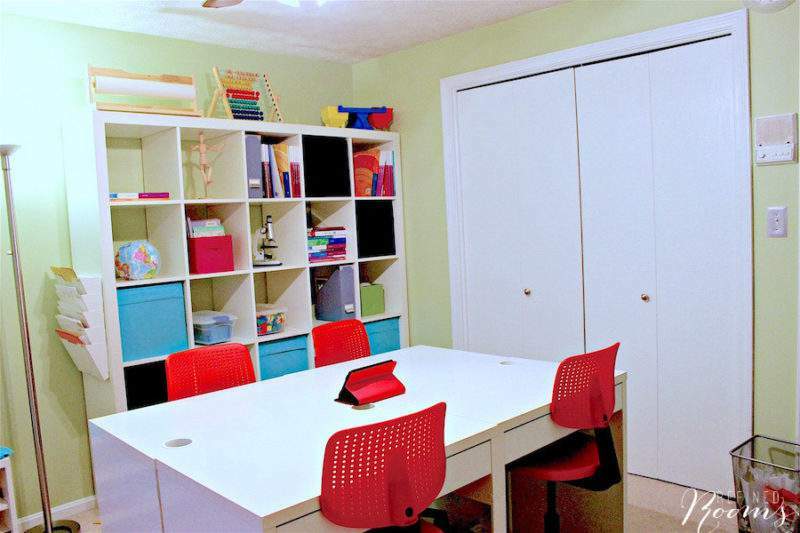 I’m bursting at the seams to take you on a tour of one of my favorite room makeovers, an organized home school space I created this past year for a client! 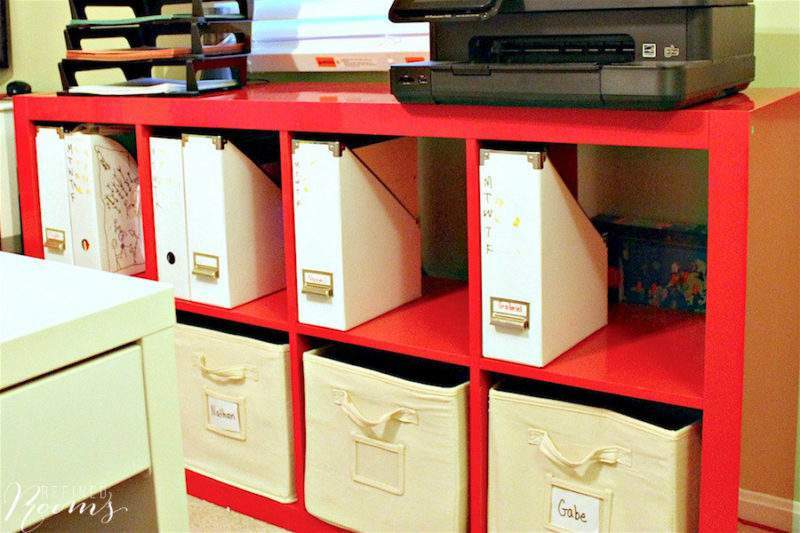 As a rule, professional organizers tend to have a love affair with Ikea…and I am no exception! You’d be hard-pressed to find a better “one-stop-shop” for value-priced organizing and storage products anywhere. Spend a few moments on Pinterest searching for organizing ideas, and you will invariably come across countless illustrations of Ikea products creating organizational bliss in homes all across the globe. And for those of you who don’t live close to an Ikea store…rejoice! Most of their product line can be purchased via Ikea’s online store OR via Amazon.com! 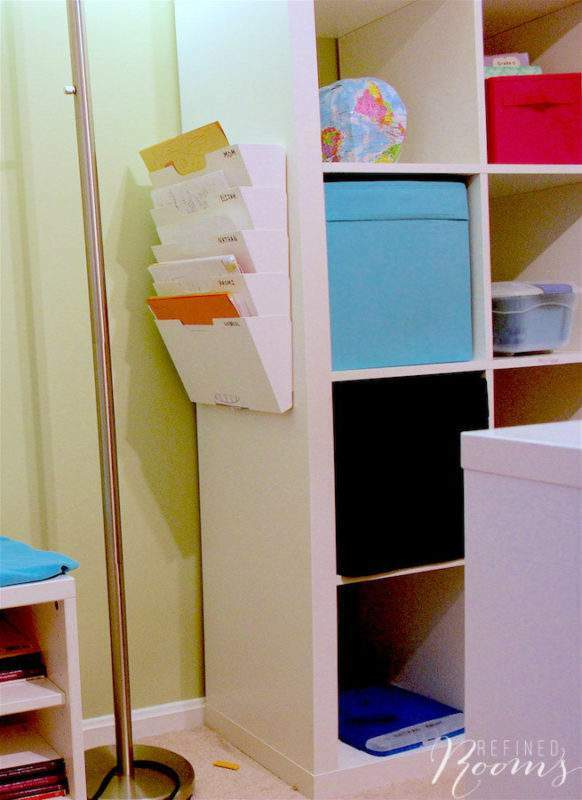 Recently, I came across a blog post that showed some great examples of how Ikea products can help you to organize just about any area of your home. It prompted me to think about the multitude of times that Ikea has come to my rescue when tackling various client organizing projects. 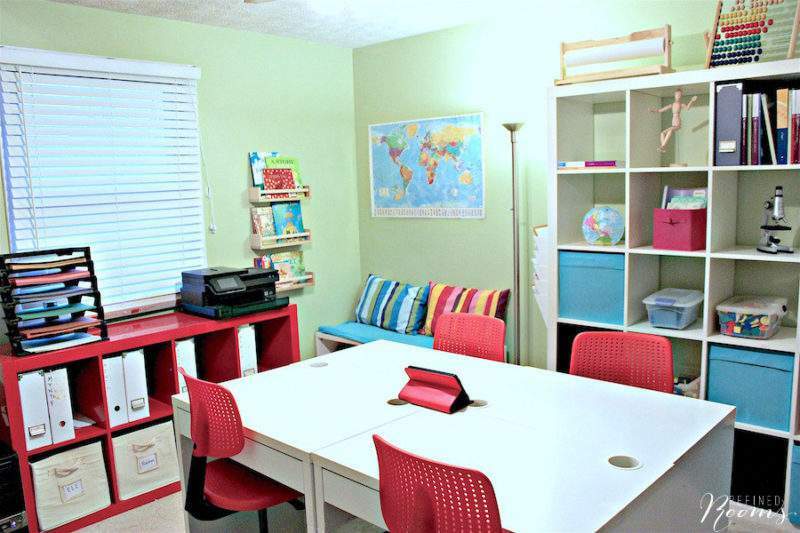 Perhaps the best example of this is a home school room that I designed last year. We started with a decorating overhaul…changing up the wall and trim paint color, replacing the window treatment and adding some much-needed additional lighting. Once that foundation was put in place, it was time to turn our attention to the organizing and storage needs for the space. Given the small size of the space, I needed to use every the trick of the trade to meet all of my client’s objectives for this redesign. One “trick”that I definitely needed to implement was to maximize storage space by going vertical. What better way to do it than with trusty ol’ Expedit shelving units? My client was lucky enough to purchase these units before they were (sadly) discontinued (FYI, Ikea’s replacement line of shelving is called Kallax, which is almost identical to its predecessor). The shelving units provide storage for teacher manuals, classroom manipulatives, student books/workbooks, and general teaching tools. We used Drona storage cubes in various colors to provide closed storage, and Kassett magazine files to corral teaching manuals and student workbooks. The larger unit houses teacher materials, manipulatives and tools, while this smaller unit is designated strictly for student books and workbooks. 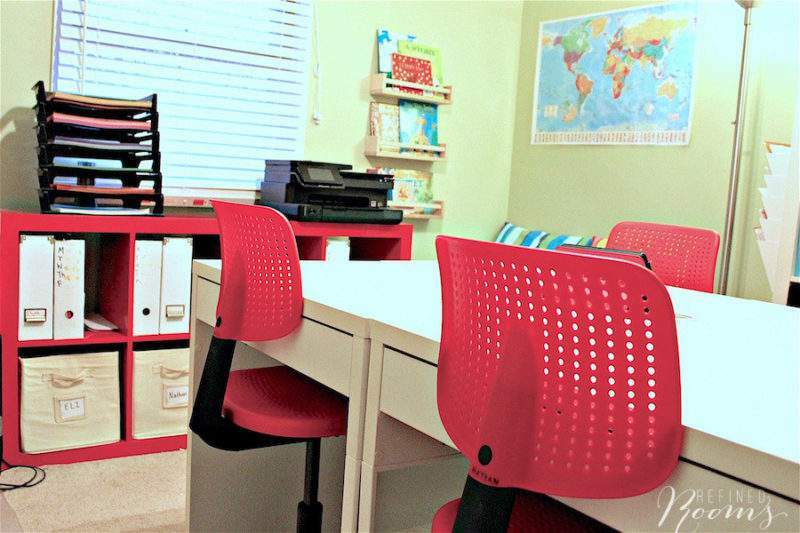 The candy-apple red color really adds a fun element to the learning environment…you’ll notice that this accent color is repeated throughout the room. I love the fact that each child has their very own set of cubbies! My client had her heart set on a reading nook in the new home school room. We created one in the corner using a Besta storage bench, which we topped with a cozy homemade cushion and pillow set. 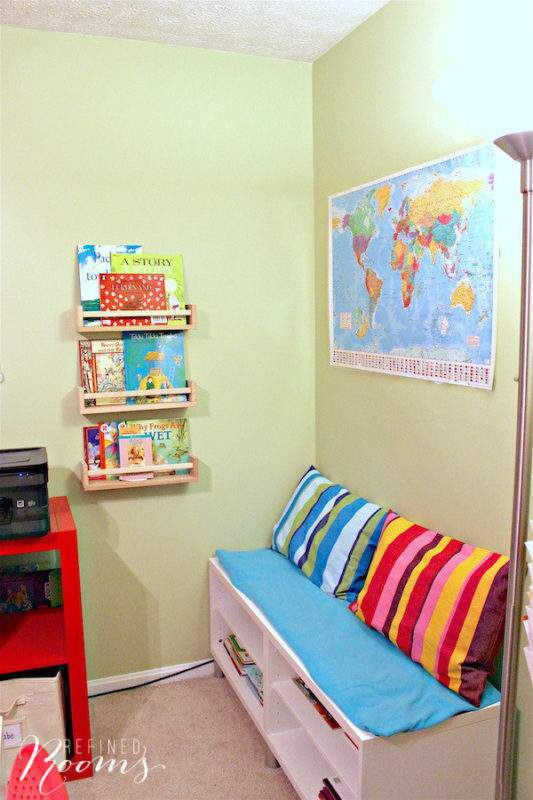 The childrens’ library books were stored in the cubbies beneath the bench, as well as on wall shelves that we fashioned out of inexpensive Bekvam spice racks (that were eventually painted red). The colorful picture books do double duty as wall art, adding a cheerful touch to the room. 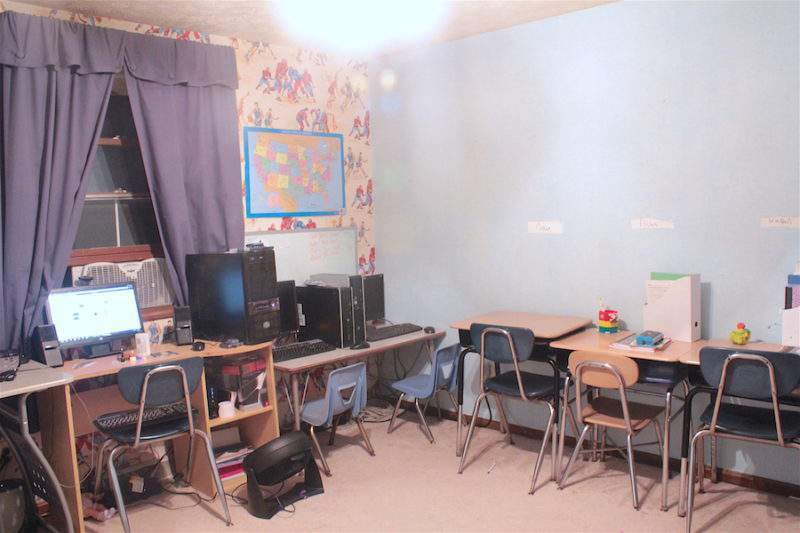 Mom also requested that I create a designated place for the children to put their completed assignments. That’s where the Kvissle wall magazine holder came in! 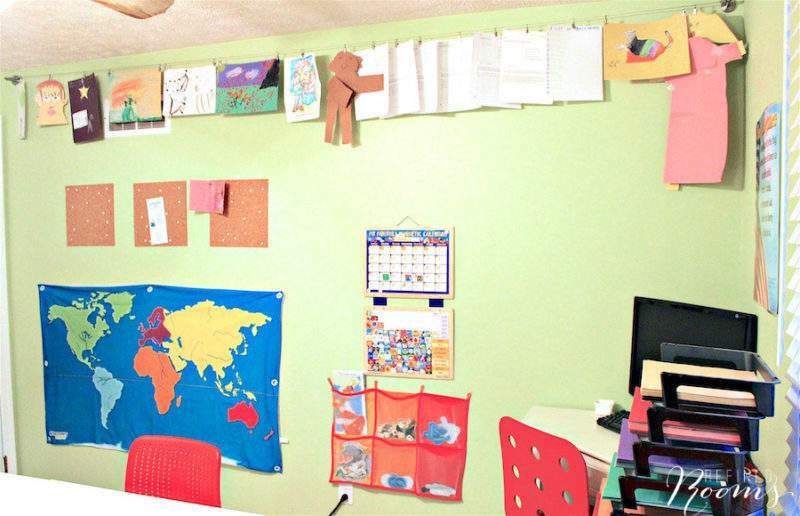 With five slots, there’s a place for each child’s work, as well as a bonus slot for Mom to tuck away her important papers. Turning our attention to the other side of the room, we used this wall primarily for display space. We implemented one of my favorite solutions for displaying children’s art work…using a series of Dignitet curtain wires in conjunction with Riktig clips along the top portion of the wall. The lower portion of the wall was used to hang a fabric map and classroom calendar. A Kusiner wall pocket serves as a handy organizer for all of the various magnets and felt accessories that go with the map and calendar. Last, but not least, let me show you where the kids spend a significant part of their school day…at this awesome “table” in the center of the room, which is actually comprised of 4 Micke desks. 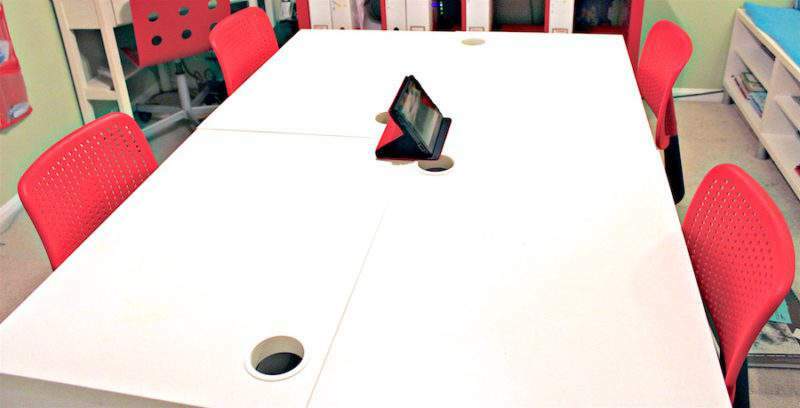 This space-saving desk configuration still enables each student to have their own individual storage space within their desk, even though it feels as if they are working together at a large table. The Jules swivel chairs are not only appealing to the eye, they provide a way for the kiddos to burn off a bit of energy by engaging in chair twirling contests between lessons! So…what did all of this Ikea organizational goodness cost my client? Roughly $900. Money well-spent, don’t you agree? 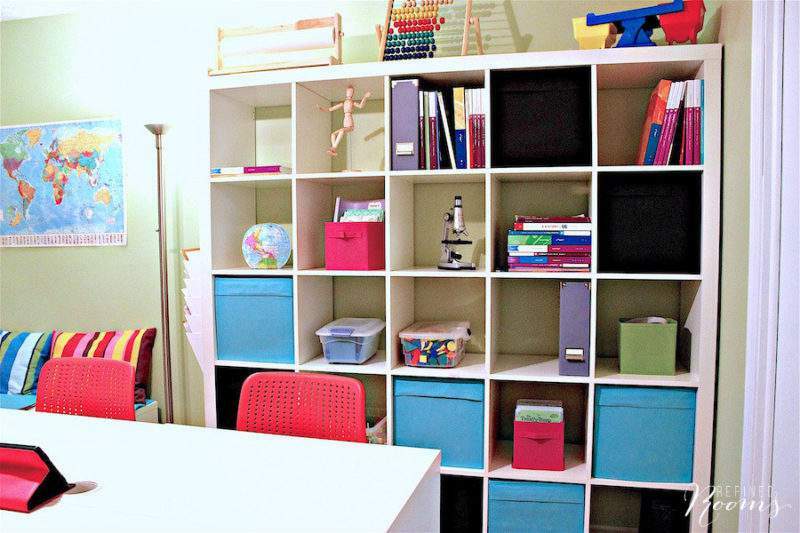 What organizational solutions have you uncovered at your local Ikea store?